Hi, I started getting ads on my forums again, yet we are paying to have the ads removed. Can anyone let me know how to get rid of the ads (and I'm not talking about the Sushi ad, I've already disabled that option). I can't find a way to reach Nabble operators by email. Maybe it's my credit card that has expired? It has been about a year since anyone was charged for ads. But if you choose not to show them bear in mind that there is nothing else to support Nabble's survival. The "Show ads" button is not on, and I have a ton of ads on every forum and sub-forum. Any other idea as to why this is happening? The ads are new code. They're not part of any old module so the settings don't affect them. I have removed ads for now as a courtesy since you were a previous customer for having ads removed and you are the first person to ask about the ads. I'll have to check what I should do in this case. I do not know whether paying to remove ads will be re-implemented. Raven - I'm leaving in a week for a vacation of a life-time and am leaving my forum with a "caretaker" admin. And I've promised my users that there will not be adverts. So, if there is any way to prevent them, even if I do have to start paying some, hopefully minimal, monthly fee, let's talk about it now, before I go, please. I do appreciate Nabble and have wondered how such a good service can be for free. I want it to stay around, so understand if there needs to be funding. Thank you very much for doing this Raven. I am also willing to pay an annual fee to make sure there are no ads. Raven, here's a possible idea for funding for Nabble. Go to Bravenet and sign up for their free embedded message board service. Notice how they have different fees for different levels of service. Bravenet's embedded forum service has been around for over 10 years so I'm assuming it's a monitization model that's working for them. The only thing I would add is users who use Nabble for free would have ads and nabble branding. Premium users who subscribe to your service would have no ads and no branding. This gives Nabble a steady source of revenue and gives us an embedded forum that's well supported. Here you go. 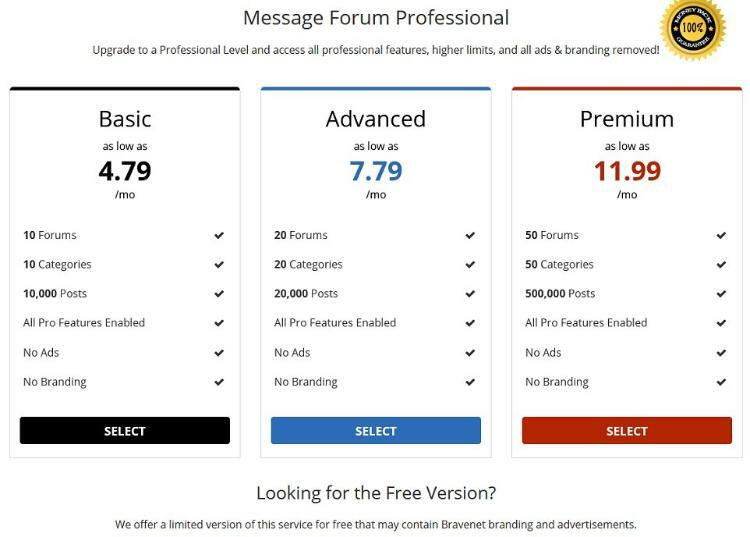 Notice how the free version of the message board service has ads and branding whereas premium customer don't. The free version is offered at the bottom. A while back there was a post indicating that ads would be removed for all, due to Nabble having "another" revenue source. If possible, It would be nice to hear about what happened and how you will move forward. I don't mind paying for services I use and a one-time fee to remove the ads, like you had before, would work for me and I don't mind giving you a link back on the footer as usual. I am opposed to the Bravenet pricing idea (sorry Flick) but that service is terrible! We have also started getting ads. I have un-checked the Show Ads check box, but as you said, it has no affect o the new ads. This is a support forum for a freely available, international, university course, https://www.nand2tetris.org. Can you please remove the ads, they are completely mistargeted for the Nand2Tetris students. We were happy with the old visit-based scheme, and would be happy to continue to directly support Nabble, but not with ads. We consider them very obnoxious. Could you do something for postgresql-archive.org that is a non profit organisation ?